Today, on the heels of one of the most successful Indiegogo crowd-funding campaigns of all time, Touchjet launched the Touchjet Pond Projector™. It’s the first consumer device that turns any flat surface into a super-sized touchscreen. A device that fits in the palm of your hand, the Touchjet Pond Projector is ultra-portable and can easily fit in a briefcase, backpack or purse. With the projector, users can interact directly with their photos, videos, games, apps and presentations on a large touch display (up to 80”) anywhere they go. 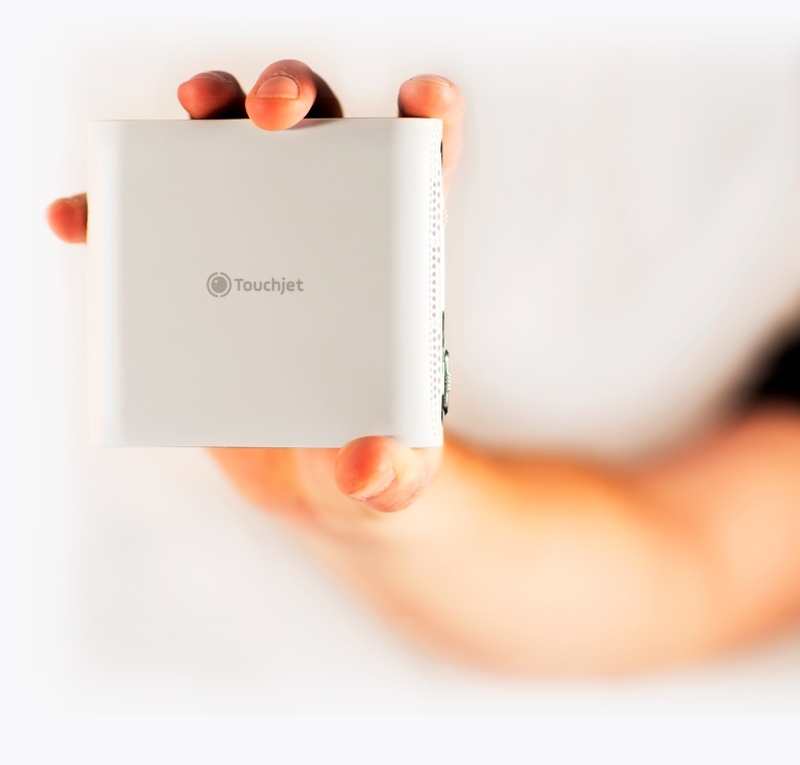 Built on the Android 4.4 operating system, the projector gives users access to hundreds of thousands of apps that can be downloaded directly to the device via Google Play. Users can also directly project from almost any smartphone or tablet using a third party app. The unique design and infrared (IR) technology brings any Android app to life with an interactive screen that users control with a stylus. In addition, Touchjet previewed the Touchjet WAVE™, the second product to leverage Touchjet’s proprietary touch technology. The Touchjet WAVE turns almost any flat screen TV or monitor into a touchscreen Smart TV (up to 60”) and features a compact, unobtrusive design with easy setup. It will launch on Indiegogo next month and will be widely available later in the year. For more information on discount rates and early access, visit the website here:www.touchjet.eu. “Mobile devices do a great job of keeping people connected, except when they are in the same room,” said Helen Thomas, CEO of Touchjet and former SVP of Worldwide Sales at Livescribe and GM of APAC International Business at LeapFrog. “We’re creating devices that take the interactivity of mobile apps and project it so everyone can share the experience, be it in the living room, classroom or a board room. College classmates Tom Li Jiang, president, and Liu Zhen, CTO, recognized that mobile devices were isolating people, as families, friends and colleagues spent more and more time “together” staring at separate screens. It’s a concern shared by families as well. A recent survey showed that 71 percent of moms feel they are losing their kids to digital screens. Tom and Liu founded Touchjet and developed the Touchjet Pond Projector and The TouchjetWAVE to change how consumers interact with their devices and each other, opening the door for shared experiences. The unique technology that powers the Touchjet Pond Projector starts with the light processing unit (LPU). Positioned near the lens of the projector, the LPU picks up an infrared signal which then runs through an image-processing algorithm. That process translates the location of the user’s gesture into a standard touch point signal. The Touchjet algorithm must process thousands of points and dozens of projected frames per second in order to deliver the seamless interactive experience. The same infrared technology is applied in a similar fashion to the Touchjet WAVE. ● At home: Bring family and friends together to play games, watch movies, share pictures and more. With the ability to use two styli at once, friends and family can join in on the fun, too. The projector can also replace other home media options — the 80” screen and functionality of Android apps make it a complete entertainment package that costs less than buying a similar-size TV and gaming console for the home. ● In schools: Create an interactive classroom with Touchjet’s built-in Android system. With access to hundreds of educational apps covering an array of topics from learning how to read to recognizing colors and shapes, Touchjet brings an interactive lesson plan to groups of students that counter balances individual tablets and Chromebooks that are taking over the classroom. ● On the go: Whether traveling for work or for pleasure, the projector’s portability is a real asset. Weighing in at 273 grams and equipped with a built-in speaker, the Touchjet Pond Projector is ideal for giving presentations, watching movies in a hotel room (or anywhere), chatting with loved ones or playing games. Samsung Electronics Co., Ltd. today announced that the all-new Samsung Galaxy Tab A will be available in the UK from 21st May. The Samsung Galaxy Tab A introduces a new screen size designed to create an improved viewing experience alongside high-performance features, making it a smart device that people can rely on every day. The Galaxy Tab A is high quality yet affordable and designed to be used by the whole family. It can be customised to individual tastes, making it perfect for anyone looking for a device that can be used by more than one person. Designed to offer maximum portability the light, slim Galaxy Tab A measures just 7.5mm – perfect for people who want a practical device they can use wherever, whenever. The Galaxy Tab A features a new 4:3 aspect ratio screen designed to deliver the best possible viewing experience. Reflecting how people are using tablets, the new screen ratio optimises the format of web pages, e-books and e-magazines to provide a better-proportioned and more natural viewing experience. Complementing this new screen display, the Galaxy Tab A also comes pre-installed with a range of premium content via Galaxy Gifts, including free online storage solution OneDrive which gives 115GB of online storage, The Economist and Kindle for Samsung. Available to download through Galaxy Essentials, Kids Mode allows parents to manage how their children use the Galaxy Tab A by controlling both the length of time children spend on the device and the apps and features they can access. Parents can also monitor usage through user-generated activity reports. At the same time, children can experience their very own ‘kid-designed’ Home Screen and take advantage of special features including Kids Music, Kids Drawing, Sticker Chart and specific ‘Friends’ and ‘Play’ sections, creating an authentic tablet experience that kids can enjoy at the same time as giving parents complete peace of mind. In addition, Multi-Kids Profile allows up to six children to have their very own personalised user profile. Running on Android 5.0 Lollipop, the Galaxy Tab A features a more refined user experience. The home screen grid system has been re-designed to fit the new 4:3 aspect ratio, while it is possible to easily transfer files via simple drag and drop into My Files. With expanded notification cards, people can view up to five notifications on the lock screen at any one time, whilst the removal of tabs at the top offers a simplified Contacts layout, with the Favourites list always showing at the top. Featuring a 5MP rear (main) camera and 2MP front camera, the Galaxy Tab A means capturing unmissable moments in stunning quality is easier than ever before. Auto Focus captures pictures of superb clarity, while One Shot Mode makes it possible to switch seamlessly between One Click Mode and One Click Recording. In addition, Continuous Shot offers the ability to take up to 20 pictures at once with just one touch. SideSync 3.0 enables the screens, windows and data of the Galaxy Tab A to be shared seamlessly between tablet and PC monitor. Features include remote notification of calls and text messages and Document Share, meaning files can easily be moved from tablet to the monitor. Quick Connect* means customers can show videos from their Galaxy Tab A on their Samsung Smart TV; stream live TV from their Smart TV to their Galaxy Tab A; and display their ‘daily briefing’ including weather, time and daily schedule on their Smart TV. Customers can now access a full suite of pre-loaded Microsoft apps and services through the new Galaxy Tab A. Through Microsoft Office, Microsoft Excel, Microsoft PowerPoint, Microsoft OneNote and Microsoft OneDrive, users can easily access, edit and store documents and photos, while the Skype app allows them to stay connected to the people that matter most. For anyone that seeks a practical device to meet both work and personal needs, the Galaxy Tab A with S-Pen is the perfect choice. The S-Pen enables mouse-like selection to easily select and move contents, while Smart Select enables images to be captured and text extracted. The Samsung Galaxy Tab A will be available in three different versions in the UK including, the Samsung Galaxy Tab A (Wi-Fi and LTE) and Samsung Galaxy Tab A with S-Pen (Wi-Fi). The WiFi version will come preloaded with the convenient Multi User mode that lets people create their own personal profile. 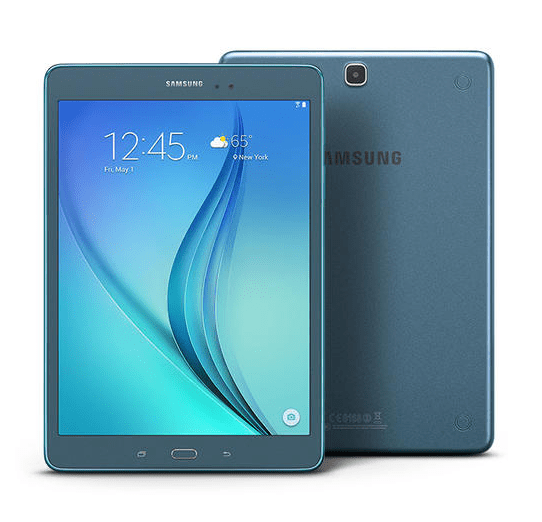 Running the new Android 5.0 Lollipop, the Samsung Galaxy Tab A features a 1.2GHz Quad processor, 1.5GB or 2GB RAM (depending on variant) 16GB storage and a Micro SD slot offering 128GB of external storage. One company making a lot of noise right now is Alcatel. Their first foray into smartwatches comes at a modest price point whilst maintaining a high quality build. The Alcatel Onewatch sees a 1.22″ 262K display covering a 210mAh battery good for 2-5 days of light to mid usage. A fast charge will see the watch topped up in 1 hour however it’s the compatibility with iOS 7 alongside android that might turn some heads. Press release follows. Global technology brand ALCATEL ONETOUCH, today announces the UK release of the WATCH – a smartwatch that puts a premium on elegant design at an accessible price. After its much-anticipated, successful debut at the Consumer Electronics Show in Las Vegas in January, it has since been honored with a prestigious iF Design Award by the iF International Forum Design GmbH. Offering the WATCH at a fraction of the cost of competitors, the smartphone brand has implemented its design expertise to offer a series of fine finishes that meet the demands of those looking for the same look and feel as a traditional watch. Available in a sporty dark red/volcano black combination, the ALCATEL ONETOUCH WATCH employs materials such as brushed chrome, micro-textured resin bands and stainless steel. The WATCH is packed with sensors: the heart-rate monitor is embedded discretely on the underside of the watch face; there’s also an accelerometer, gyroscope, altimeter and e-compass. The WATCH also allows users to track their sleep cycle, distance covered, steps taken and calories burned. An activity overview allows users to monitor their fitness goals. When the smartwatch is connected to a smartphone, it sends users call notifications; social media updates and vibrates if users stray too far from their phones. Touching the WATCH’s screen activates a multimedia remote control. Users can control music, take pictures from their phone from a distance or make their phone ring in order to locate it. The WATCH is compatible with any phone running on Android 4.3 or above and on iOS 7 or above. It is also dust and water-resistant, with a long battery life. 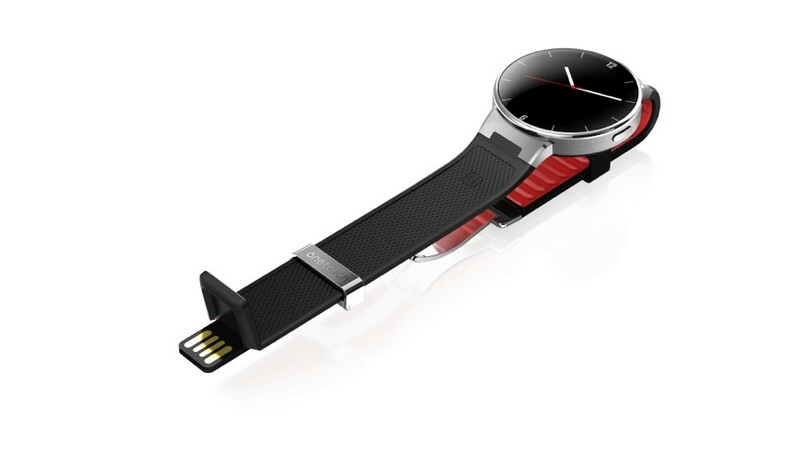 The WATCH has a USB connector integrated into its band for simplicity of use. With beauty and functionality integrated into one device, ALCATEL ONETOUCH offers a smartwatch at a smart price, fulfilling its mission of making the latest technology available to all. The WATCH will be available first from Currys PC World stores nationwide and online (at www.currys.co.uk, www.pcworld.co.uk) for £99.99 from mid-June.